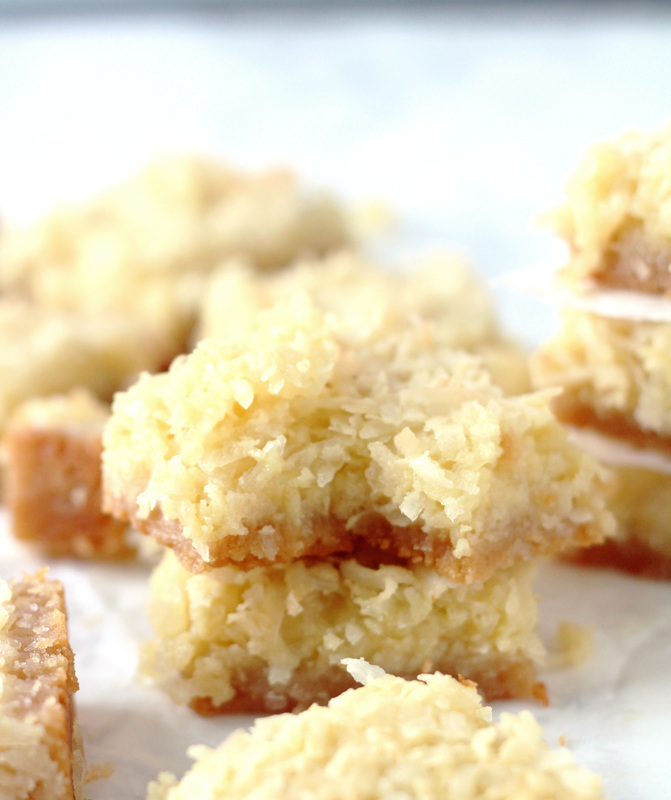 These Butter Coconut Bars are absolutely divine! A buttery crust, topped with a sweet, gooey coconut filling which includes sweetened condensed milk. . . .my favorite! This bars will instantly become a favorite! 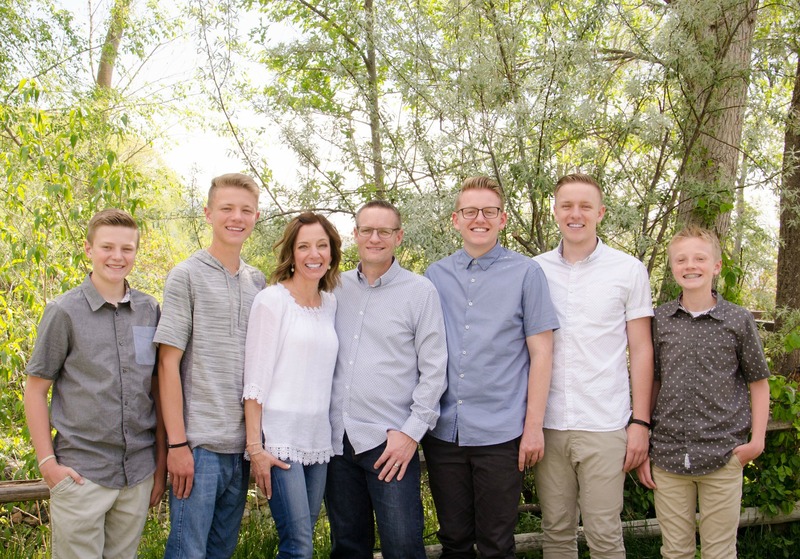 Holy moly, there aren’t even any words to describe how amazing they are. I had to pawn them off on friends and my husband’s co-workers because I would have eaten the entire pan. When my husband came home from work and tasted one, he was in the same boat I was in. He would have eaten the entire pan if I hadn’t gotten rid of them. Within five minutes of me dropping them off to three different friends, I got two texts and one phone call telling me how amazing they are! My friends have very good taste! These start with a buttery crust made from brown sugar, melted butter and flour. 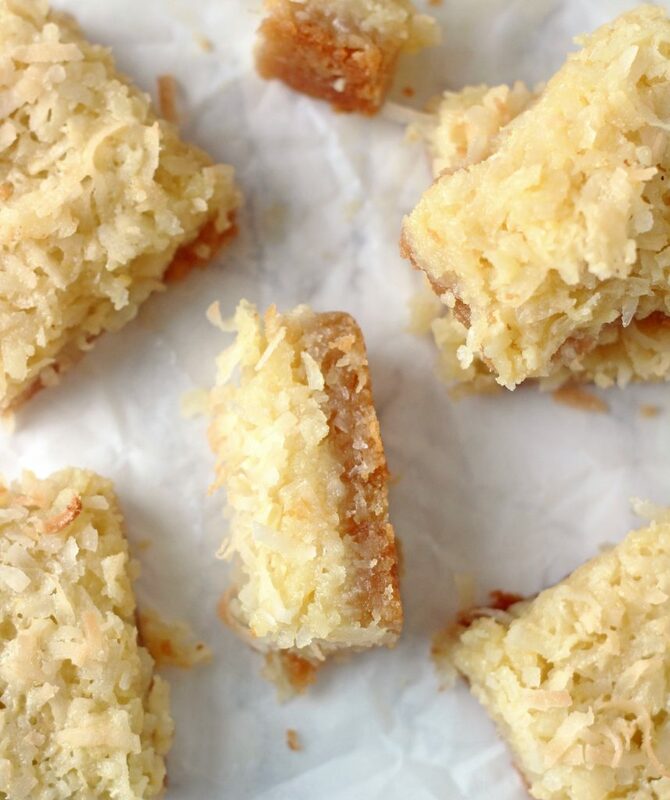 That’s pressed into a pan, partially baked, and then topped with a decadent coconut filling. Now while I absolutely love coconut, if I’m being completely honest, the star of the show here really is the sweetened condensed milk. Isn’t everything better with sweetened condensed milk? Then they’re topped with more coconut and put back in the oven to finish baking. End result is utterly divine! Buttery, sweet (but not too sweet) and packed with beautiful coconut! They’re simply perfect and if you’re a coconut lover like am, you’re going to love these! Preheat oven to 350°. Line a 13x9-in. baking pan with parchment paper, spraying only the sides, lightly. In a large bowl add the flour, brown sugar and salt, mix well. Add the 1 cup melted butter and mix until well combined. Press onto bottom of prepared pan. Bake until light brown, about 15 minutes. Cool 10 minutes on a wire rack. Reduce oven setting to 325°. In a large bowl combine the eggs, sweetened condensed milk, flour, brown sugar, 1/4 cup melted butter, vanilla and salt, whisk until blended. Stir in 3 cups of the coconut and spread the mixture over the warm crust. Sprinkle with the remaining 1 cup coconut. Bake until light golden brown, 25-30 minutes. Allow bars to cool on a wire rack. Lifting edges of parchment paper, remove from pan. Cut into bars. IF YOU TRY THIS RECIPE, COMMENT BELOW! I WOULD LOVE TO HEAR WHAT YOU THINK! Yummy!! Gonna try these soon, Jodi! Hi Kim! I actually just used my hand mixer for the crust layer. Because the butter is melted, it mixes together really easily. Let me know how they turn out for you. Oh my goodness, Jodi..these are sooo yummy!!! I had everything on hand except for bagged coconut so I used the frozen kind instead..hubby even approved! I’m impatient to wait for complete cooling so I’m sure they’re even better not warm. Thanks again for another scrumptious recipe!! Happy Spring! Thanks Kim! I love hearing back from people when they make things, so thank you for taking the time to leave a comment. These bars are definitely evil, that’s for sure. Take care! These are sinfully delicious! The sin part comes in when the first thing you put in your mouth is a buttery coconut bar after you’ve had a great workout at the gym! So good! Hey girl, I warned you!! So glad you loved them! Had these for a Shower last night at my house and they were the hit of the whole evening! EVERYONE wanted the recipe!! THANK YOU!!!!! Making these again!! Right now! Triple Chocolate Marble Fudge – 12 Days of Sugar, Day 12!!!! !